Searching for the ultimate product that helps your hair to look fabulous, feel fabulous and smell fabulous can often be a fruitless mission. However, often it’s the products you’ve used and loved in the past that need to be brought to the forefront once more. Paul Mitchell Super Strong Daily Shampoo and Conditioner used to be my most loved hair product, sitting on my bathroom shelf for the best part of three years. Having a heat damaged barnet that’s also been dyed more times than I’ve had Sunday roasts, I constantly struggle with keeping it in a good condition. The Super Strong range really helps to inject a bit of goodness into my hair, providing it with the nutrients it needs to look and feel healthy with exceptional shine. Not only does Super Strong help to strengthen, repair and rebuild hair damaged by chemical, environmental, or thermal abuse, it also includes shine-enhancing conditioning agents that help to reflect the light without weighing down hair. Both products contain the unique ‘Super Strong Complex’ which penetrates deep into the hair cortex to help rebuild the internal structure. Although this all sounds quite intense, the products are actually very gentle to use and even suitable for coloured hair on a daily basis. The shampoo provides a rich lather which really lifts away dirt and product build-up, while the rich conditioner penetrates quickly to leave hair feeling soft and looking shiny. Having not used these for a couple of years, when I finally added them back into my routine I remembered exactly why I loved them so much. Because of the quality of the formula (and the fact that ingredients are packed tight,) you need only a little amount for it to really work its magic. With some hair products you really need to use them over a number of weeks to see and feel a difference; however, with Paul Mitchell Super Strong the results are practically instantaneous. 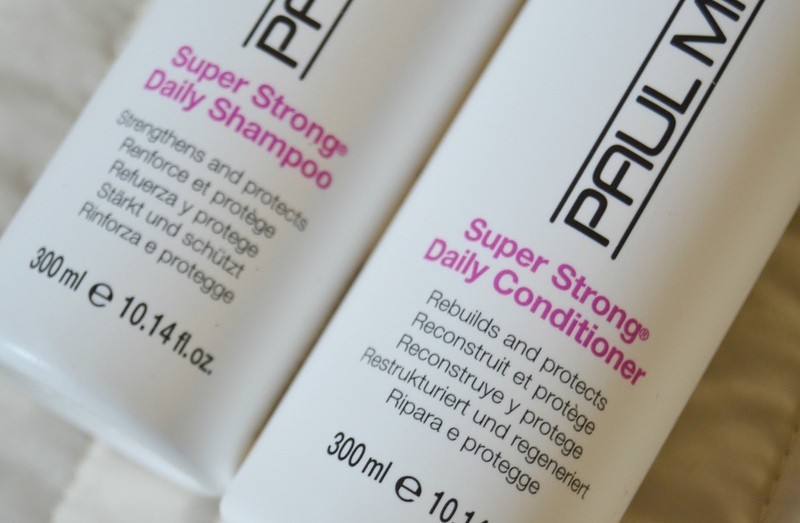 If you straighten, dye or excessively style your hair, then a little bit of Paul Mitchell in your life could really help to revitalise and refreshen your tired barnet; it’s a must have. The Super Strong Shampoo and Conditioner is available in a duo for a special price of £20.95 exclusively in professional salons and online.